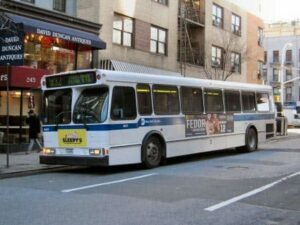 Taking a New York bus is safe and easy, although it is not suitable for those in a hurry. 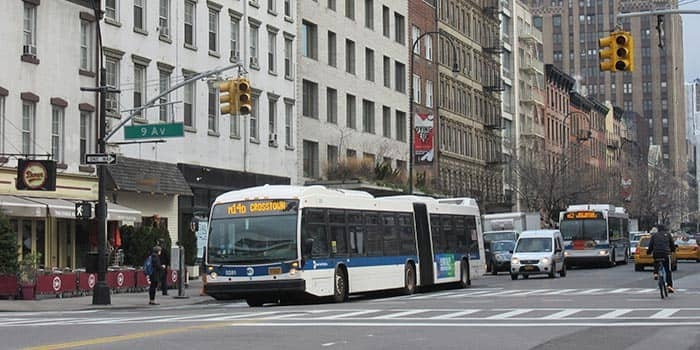 If you no longer want to walk, then riding the bus is a great way to see New York. The buses are blue and white and all have a number and a sign on them digitally displaying the destination. A bus ride costs only $2.75 and can be paid by either exact change (silver coins only) or using the same MetroCard that you use for the subway. With an Unlimited MetroCard, you can also use this to pay the fare on all New York buses. With your MetroCard, you can automatically switch to another bus or ride the subway. If you pay with cash, then you need to request a transfer ticket from the driver for your next ride. Buses stop only at designated stops during the day. Between 22:00 and 05:00, you can ask the driver to stop anywhere along the designated route. All buses are equipped with wheelchair lifts. At night, the bus is a safe alternative to the subway. Some routes offer a Select Bus Service, designed to reduce travel time and increase the comfort level for customers. One regulation, to help improve the efficiency of these buses, is that travellers must pay before boarding the bus, instead of on the bus. There are vending machines at the bus stops, which you can use to pay for the ride. You can either use your MetroCard, or pay cash at the machines. You’ll receive a receipt which you need to keep throughout your ride. After paying you can use all doors to enter the bus. On the map you can recognise Select Bus Service lines as ‘SBS’.